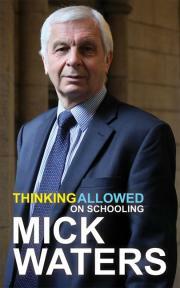 Mick Waters has been a headteacher (twice), Chief Education Officer for Manchester and Director of Curriculum at QCA. He is now Professor of Education at Wolverhampton University, a trustee of the Children’s University, and president of the Curriculum Foundation. And in his spare time…? As well as being a sharp and funny conference speaker, he has found time to write the witty and provocative Thinking Allowed on Schooling. We hope you enjoy these extracts about Ofsted. The ruses for passing the Ofsted inspection have become urban myths… the things that everyone knows happen but everybody says somebody else does. There is the constructive use of work experience and educational visits that just happen to occur on the day of the inspection so that certain pupils or groups are not on the schoool premises. There is the way we say ‘We’re in a collaborative’ or ‘We’ve formed a working group’ in order to show that we are dealing with a serious issue the inspectors might have noticed. How many schools produce their own statistics, developed by ‘our own data manager’ which are more valid and powerful than anything that we can get from RAISEonline or the Fischer Family Trust? Of course, every school would deny that they borrow good staff simply for the inspection but it does happen… What school does not have contingency plans in place – the local vicar on standby, practising the parent workshop in advance, asking a local sculptor or the police to be available at short notice? If all else fails, send for a travelling circus. Day after day, teachers are observed by senior managers who say ‘What Ofsted want is…’ in order to secure better judgements. Would it not be better if the dialogue centred on the words ‘What these children need is…’? First we need to remind ourselves that inspection is not an isolated process. Ofsted affects lives on many levels. The drive to increase the number of academies and to break any remaining bonds of local democracy means that the unwilling have to be offered no alternatives. Many schools that have been working with their local authority to improve, often against the odds, know it is now only a matter of time before Ofsted brings its next framework and the almost inevitable prospect of being in a ‘negative category’. There is a resigned acceptance as they wait for the drop and possibly the chop. The secretary of state states publicly that head teachers have autonomy and freedom. Yet many heads smile wryly and see only their freedom to be afraid. HMI subject and theme reports, now called Survey Reports, consistently and constantly state that the quality of teaching in subjects needs to be better with more practical approaches, less textbook use and more application to real life and the working world. They want to see pupils enjoying the beauty, big ideas and power of subject disciplines. The much respected HMI regularly complain that the richness of learning is being sacrificied in the pursuit of test scores. How can it be that HMI say there are so many concerns in subject disciplines when Ofsted school inspections fail to spot them? This is a serious contradiction. It could be that some of the schools that are being categorised as good and outstanding are playing the game of defeating the inspection, while not actually improving the learning for pupils. Maybe some of the schools are being classified as good while becoming worse at education. Then there is the sort of ‘Ofsted tweeting’ that happens as different practices run through the school system because a rumour goes around that this is now what Ofsted are looking for – so give them what they want to see. After all, inspectors are always keen to find evidence to put in a report to validate their judgement. For example, an inspector refers to the use of 3D replicas that bring learning alive. While checking the Ofsted website for reports submitted by the lead inspector of the team due to visit their school next week, the head teacher sees the reference to 3D replicas and, within no time at all, they are part of the fabric and routine of learning. There are web-based products, books and courses to help the school leader feel confident in their capacity to take on the inspection team. Inspectors sell their ‘secrets’, amassing significant status because they can tell others how to beat the system. One such course advertises a new approach to school self-evaluation as having the solution that will ‘make the inspector tingle’. If only our outlook were to make the children tingle with the excitement of learning.